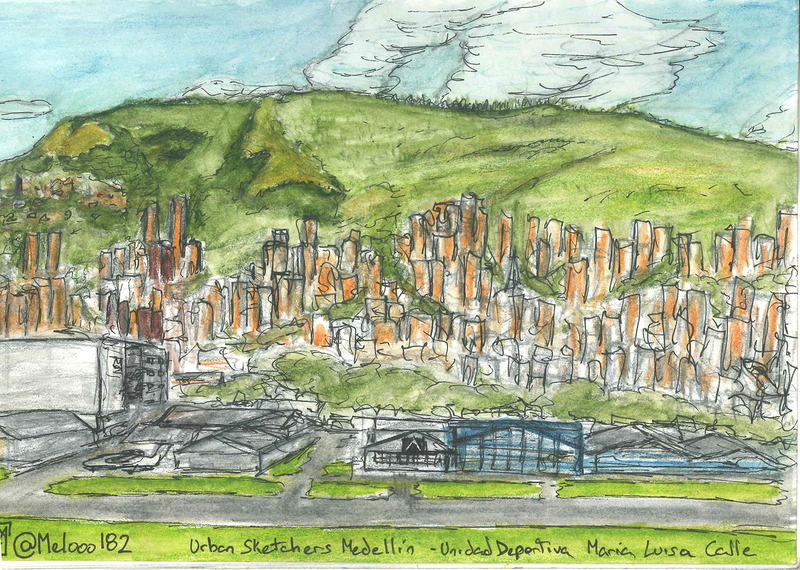 This is my fifth post about the Urban Sketchers of Medellín, this time we went to draw at Sport Centre Maria Luisa Calle, it was really awesome specially because that same day there was Literature Festival with many events and stands to see, so we stayed until late night. This time I went to draw the view from the grandstands of the sport centre, I know again a city scape with mountains in the back but this time I used watercolour!!! it was really fun, one of my new friends I from Medellín, ? gifted me her brush pen with a water tube in the back so you can pick the dry pigments directly or in my case apply Aquarelle Crayons over the paper and then pass over the brush to spread the colour. BTW her Birthday was on Monday, two days ago, so I gifted her a drawing of her, coloured with the brush pen she had gifted me two days before ? Here is the photo of the Urban Sketchers group from that day ? It was a very fun session ? Click Image to see full sizeI hope you liked my post about Urban Sketchers ? Let me know what you think in the comments bellow ? Have a great day people, until the next post! ?? ?